I was born in remote village of Himalayas in Uttarakhand near to Kedarnath Temple(LORD SHIVA). This small mountain state was separated from Uttar Paradesh on 9th November, 2000. We have beautiful Himalayan range and many Glaciers, like Gangotri Glacier (Gaumukh), Pindari Galcier, Milam Galcier etc. But it's pity these all glaciers are in Endanger due to Global warming and Humanly disasters. Lets please save Himalayas and keep it CLEAN AND GREEN. I'm in favor of to promote eco-tourism in Uttarakhand Himalayas as clean and collect the garbage from beautiful meadows, Glaciers, Excursion sites, Pilgrimage sites and in the forests spread by trekkers and hikers. We have very rare and unique culture as folk dances in remote areas of Uttarakhand but it couldn't explored due to non-policy of Uttarakhand Tourism. If this art will be remain unexplored so it can be vanish one day from history of Uttarakhand. I tried by my self to promote this cultural art by help of my friends from Germany, U. S. A. and Taiwan. Uttarakhand Himalayas is rich for flora and Fauna we have many World Heritage sites as "Valley of Flowers" and "Nanda Devi National Park". I'm well known about remote culture, flora and fauna of Himalayas. We have 648 species of permanent birds out of 1200 species in India. Monal Pheasant is Bird of Uttarakhand state. Well I was born on the "LAND OF ABODE" so I got knowledge about Hindu religion and Hindu Mythology too. At present I'm living in Rishikesh a small town known as International capital of Yoga which is situated on the bank of Holy Ganges. Many tourists, Hindu religion and yoga-meditation seekers visit this beautiful town every year. Yoga was became popular with Swami Shivananda in 1936 A. D. from this Holy town. This town is surrounded by Shivalik mountain range so it's base of Himalayas. Rishikesh is famous for many Ashrams and Temples. Many Gurus like Maharshi Yogi, Swami Shivananda and many other Yogis and Gurus start their spiritual life and spend the time in this town doing meditation-Sadhana on the Holy bank of Ganges. Rishikesh is Gateway for all 04 Pilgrimage centers (Yamunotri, Gangotri, Kedarnath and Badrinath) in the Himalayas. Uttarakhand is well connected by Road, Train and by Air from Delhi the capital of India. "LETS SAVE MOST SENSITIVE ECOLOGICAL SYSTEM BY JOINING HANDS TOGETHER"
P.G. Diploma in Mountain Trek and Trail Management from Garhwal University in 1988. Mountaineering Course from Nehru Institute Of Mountaineering in 1988. Working Experience with U.P. Tourism Since 1988-1990(Government). 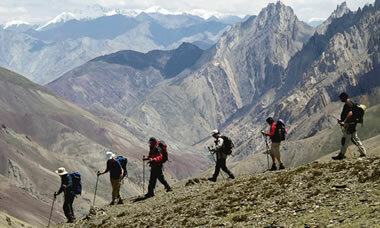 Working as Professional Trekking and City Guide since last 20 Years Since 1990. B.C. Bhatt from Iron Horse Adventures has acted as our guide and interpreter on a beautiful tour hrough Northen India targeting mount Shivling and the Bhagirathi Group after visiting Resource of Ganges, Gaumukh. The qualities as mountain guide are quite exceptional- the guide has the rare sensitivity to adjust the tour to the liking an prowess of his clients. I wish to my thanks to Iron Horses Adventures for providing me such kind of professional service as my six days trek to resource of Ganges Guamukh; the true source of Maa Ganga.The interesting story and history of region and mountains provided by guide B.C.Bhatt throughout the tour added to my enjoyment. Gordon C. Pine from Vermont U.S.A.